Watch Instantly Special! My top two selling DVDs + Distance Communication Report, all for only $100! Click here for details. Welcome to Holistic HorseWorks, LLC! April and her 12 Global Certified Instructors are all sharing their healing knowledge, success stories and recipes to help you help your horse. We ask our members to also share their healing advice and success stories as well.Our main objective is for this site to be the ‘go to’ when your horse is in distress or having a severe issue that you can go here (while waiting for your Vet) to help your horse immediately in all situations. We want to be your healing resource and to share all this knowledge globally. Disclaimer: This is not meant to be a diagnosis or treatment or to replace your normal Veterinary care. April Battles (email) and her Global Certified Instructors, have an amazing ability to teach you equine holistic therapy best practices. Learn how to find and release the deep Musculoskeletal and Cranial energetic blocks in your horse; which will help your horse come back to being a happy, comfortable, balanced and fluid mover under saddle. This is deep physical body unwinding releasing stuck skeletal issues as well as tight muscle issues not allowing the joints to load correctly causing mysterious lameness issues. Yet is very easy on us to do. I’ve had equine holistic therapy students from age 12 to 80. How does this help your horse? She teaches you how to do this in her 3-day class. If you are unable to make it to one of her classes, you can try her home study program on DVDs. (530) 823-7321 Hawaii time. Why do well-trained horses buck? Because they are in pain somewhere in their bodies, say most professional trainers. Mysterious lameness? It all starts somewhere. The signals that are frequently missed include pinning the ears, swishing of a tail, unwilling to switch leads, girthy, tripping, or cross firing at the canter. April has helped many horse owners to learn holistic horse training and how to help their own horses. You can see for yourself in her FREE stretching video called “Yoga For Horses.”  Please watch this holistic horse training video, “Introduction to Holistic Horse Works with April Battles” (at right) on how the body is connected. If you knew your horse was in pain, what would you do? Sidebone — what can you do about it? April is a holistic horse training specialist and has the ability to be able to easily listen to what horses have to say and then explaining to their owners how to help the horse release any energetic blocks your horse might have. In her DVDs, she walks you through and explain how to help stretch and release these areas yourself. In the DVD category and you will find the special offer Two DVDs & April’s Listening Session together. This package includes the DVD of April’s 3-Day Workshop and a step-by-step equine holistic therapy workbook. The student can choose to take the workbook test and submit 5 case studies and upon approval, they will receive the Level 1 Certificate of Completion. The Horses Are Talking – Are You Listening? The majority of training and behavioral issues are caused by pain issues in the horse’s body that are easily corrected. This results in a horse that is unwilling to switch leads, girthy or is a cold backed horse, unable to engage its hind end. These issues lead to high/low syndrome in hooves, roach back and hunter bump calcifications as well as arthritic hocks and side-bone. 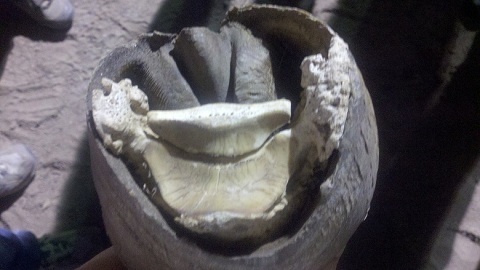 You can fix this with holistic horse training! Picture of a skeleton notice first rib differences – April’s DVD “Horses Are Talking” shows you how to stretch the body so it can release these issues. When the first rib is out, it does not allow the shoulder to move correctly as described by most horse chiropractors. On this skeleton you will see under the horse’s right shoulder (left side of photo), there is no gap. The first rib was out on the right side, this can make taking the right lead very uncomfortable. As well as making the left front leg work twice as hard, as you will notice by the left hoof, which has grown larger taking most of the weight of the horse. This causes stress on the left tendon and suspensory ligament. Also, stress would have been thrown back to the inside left hock as horses work a diagonal and right stifle, the same side as the rib that is out. To confirm this, ask any professional trainer how the horse uses their body when in work. When horses are unwilling to take a certain lead this is generally the major cause, not that they are lazy, or don’t want to, or that they have a weaker side. Soft passive stretching can help the rib issue and comfort and ease returns to the horse. Yoga is good for horses as well as it is good for us. It makes horses feel better and improves their willingness to do what we ask of them. Come find out more in my workshops! Why Holistic Horse Works and why Equine Holistic Therapy? April has discovered that many things can contribute to a horse’s emotional, physical and mental well-being or distress. In fact, generally, training and behavior problems are pain related. Many things that contribute to a horse’s comfort or lack thereof include, but are not limited to, saddle fit, diet, and living conditions, as well as regular routine and activity. April has used, endorsed and been a distributor for treeless saddles for over thirteen years and has logged over 42,000 miles in them! She recently sold her treeless saddle business to devote more time to helping horse owners help their horses. You can view saddles here as she recommends allowing the horses back to move more freely, without the restriction of a solid tree. Please click here to view treeless saddles. Additionally, April has discovered that some of the answers to the changes she sees in her equine partners in equine holistic therapy may be related to a build-up of toxins in their bodies, mainly the Thimerosal and other by-products currently in today’s vaccines, as well as chemical wormers. April has found a product that has worked wonders–not just in her horses, but also in herself! It is called Natural Cellular Defense, a supplement that when ingested into the body, toxic elements are naturally drawn to it. The toxins, which can keep the body from functioning properly are then effectively flushed from the body allowing it to heal and maximize its performance. Once the body is detoxed of heavy metals and chemicals then the true nutrients can nourish the cells and replenish the body. Please check out this link for nutritional supplements for horses, humans, dogs and other companion animals. When April is asked what she uses on her personal horses, she sends horse owners to the professional websites so they can do their own research. Stretching and working out energetic blocks in your horse can have lasting results. After a 1 hour and 20 min session…YES, this is the same horse! Sidebone has been found in horses as early as the age of 3 years old, it occurs when the body has not been loading the hoof correctly. On my YouTube channel you will see that I used Wound Balm sweats to decrease sidebone calcifications in my two horses. Ever heard of rib/wither lift? Thermograph pictures before the stretch for ribs and withers. (compliments of Jeroen Van Oostveen Owner of “Rivendal” Netherlands) who was our gracious host in April 2013. What an amazing difference! Come join us and learn how to do this for yourself.